The 1-Day Investigator course is specifically designed for managers, supervisors and safety representatives who are required to take part in incident investigations but not necessarily required to lead the investigation team. The course introduces delegates to the Kelvin TOP-SET incident investigation system and teaches participants the specific steps of investigating an incident using the TOP-SET process. A variety of short case studies and worked examples are used to stimulate discussion and reinforce the concepts being taught. Some of the concepts explored during the course include the significance of change, and how missing barriers and defences and the by-passing of controls can influence the circumstances leading to an incident. The course also pays particular attention to the investigation of near hits and minor incidents as a method of preventing more serious incidents from occurring. The learning objectives are similar to that of the Kelvin TOP-SET 3-Day Senior Investigator Course but at a much more basic level. After attending this course delegates will be able to actively participate in an incident investigation team and will have a good understanding of how to investigate an incident using the TOP-SET methodology. 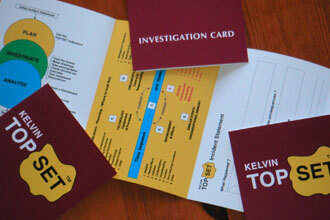 Participants will receive a Kelvin TOP-SET ‘Investigator’ certificate on successful completion of the course. We can also offer “in-house” courses at a location and on a date of your choice if this is more convenient for your organisation. Please contact us if you would like to find out more about this option [email protected].